Electricity Minister Mohamed Shaker has declared that Egypt is a founding member of the International Solar Alliance (ISA). Owing to its geographical location between the Tropics of Cancer and Capricorn, Egypt possesses rich renewable energy resources, especially solar energy, Mr Shaker remarked. 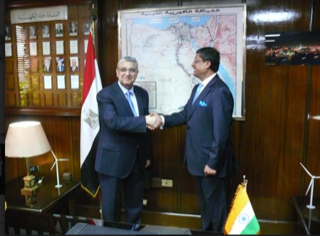 The ISA framework agreement was signed in the presence of Indian Ambassador in Cairo Sanjay Bhattacharyya. Mr Shaker noted that this step comes within the framework of the Egyptian government’s keenness on expanding the use of renewable energy, especially solar energy applications. The International Solar Alliance is a common platform for cooperation among sun-rich countries lying fully or partially between the Tropics of Cancer and Capricorn who are seeking to massively ramp up solar energy، thereby helping to bend the global greenhouse emissions curve whilst providing clean and cheap energy. Countries، bilateral and multilateral organisations، companies، industries، and stakeholders aim to reduce the cost of finance and cost of technology for the immediate deployment of competitive solar generation، storage and technologies adapted to countries’ individual needs and to mobilize billions of dollars for solar. The initiative was launched at the UN Climate Change Conference in Paris at the end of 2015 by the President of France and the Prime Minister of India. The ISA aims to address major challenges related to solar energy, and attract one trillion dollars from international institutions to finance solar energy programmes, Mr Bhattacharyya said. India and France are co-hosting the first International Solar Alliance (ISA) Summit to be held in New Delhi on 12 March to promote solar energy. The summit will be attended by the heads of state from 23 nations, including France, Australia and India. 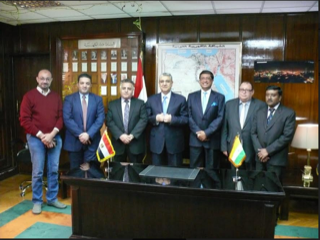 Mr Bhattacharyya congratulated Mr Shaker, saying that, with Egypt joining ISA, there will be growing opportunities for cooperation in the field of solar projects, including the financing of projects in Egypt under India’s Line of Credit (LOC) programme.